What's the best kind of day? A "Cake Day" of course! "Cake Day" is the third book in Star Bright Books "Small Talk Books" series, which displays some of the ways that families can best interact with their young children to enhance language and other preschool skills. You can read my first reviews of "A Fish to Feed" and "Banana For Two" in previous blog posts here and here if you'd like to learn more about the Small Talk Books series. Thank you to Star Bright books for sending me each of these books-all opinions are my own. "Cake Day" has been a favorite in my house over the last few months. It turns out my kids like reading about cake almost as much as they like eating it! "Cake Day" is the story of a young boy and his Grandma baking a cake for a special occasion. 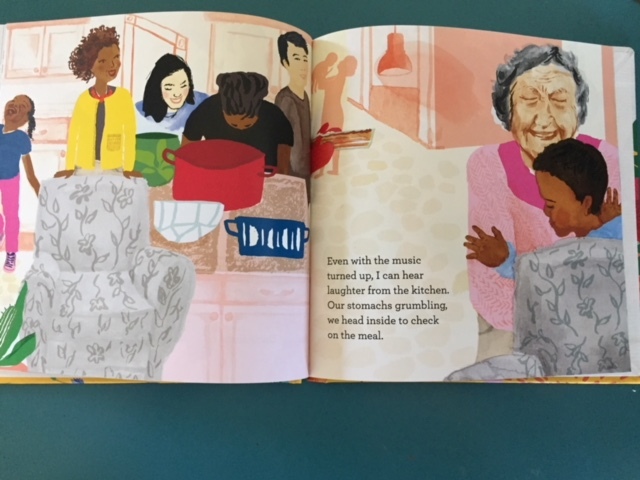 Throughout the story we see the warm and easy interactions between the boy and his loving Grandma, as well as the multitude of every day learning opportunities. Grandma is constantly helping the boy to make observations, asking questions, answering his questions and responding to his thoughts. She also models conventional grammar and speech patterns as she talks naturally with the youngster. I wonder who will clean up all that flour?! Many parents worry that they have to do something special to "teach" their children to talk, as a parent of a child with a speech delay, thoughts about what I can do to help improve his speech are always on my mind. "Cake Day" helps to point out that simply speaking to little ones frequently, and in the proper patterns and conventions is a huge part of "teaching" language development. 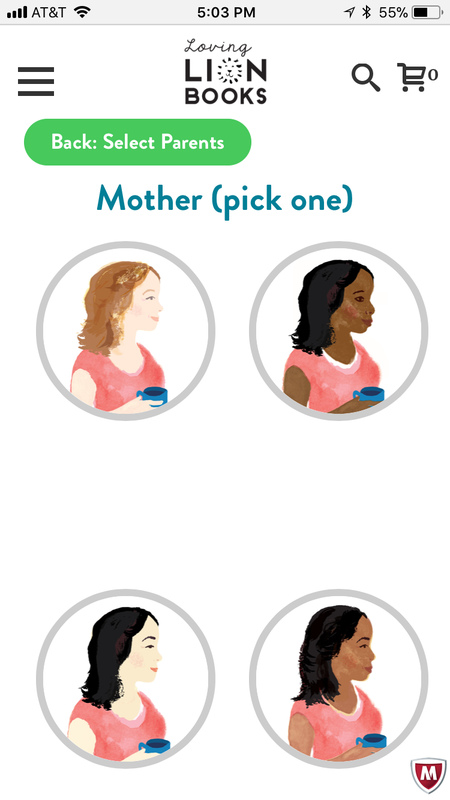 Rather than worrying about giving an outright correction to short sentences or incorrect grammar, the Grandma models longer phases and sentences, and includes proper speech in her conversation with the little boy. The story is very cute and one that children and adults alike will enjoy reading. The conversation modeling and included professional note about language development are an added and appreciated bonus-as well as the cake and frosting recipe, so that you can have your very own cake day at home! Grandma has some great helpers! With each tray I also included sprinkles, birthday candles, cookie cutters, plastic cake toys, and muffin trays. WE had fun making our own little cakes and decorating them in the muffin tins, squishing and spreading the "dough", filling the tins, making shapes, and of course E discovered that the dough was a great new thing to drive his trucks through! Yellow, brown, green, and every shade in between. How do you like your bananas? Maybe a banana is best when shared with a friend, as in "Banana for Two", the next book in Star Bright Books "Small Talk Books" series. You can read my review of the first book, "A Fish to Feed" here. "Banana for Two" is a cute, simple story for young children and their families. This entertaining board book, is perfect for babies and young toddlers. The illustrations are warm and inviting, and young children will likely recognize the familiar setting of a grocery store, and the experience of shopping with a caregiver. This book features a mother and small child (as well as a cameo by the family from "A Fish to Feed", which is a cute touch). Also of note is the fact that both "A Fish to Feed" and "Banana for Two" depict diverse families. Beyond being a cute story for little ones, this book is a great resource for parents and caregivers. As with the other books in the Small Talk series, "Banana for Two" features an educational message for parents, as well as modeling throughout the text. The goal lesson in "Bananas for Two" is in the importance of incorporating conversations at math from a young age, and in noticing the importance of math in everyday life. From my teaching days, I can certainly confirm that many children (and even adults) often question why they must learn math, or how it relates to them. Incorporating math into simple everyday conversations from an early age could certainly have a positive impact on a child's interest in math and early math skills. "Banana for Two" shows how simple it is to do just that-and provides parents with a little extra confidence in their math talk skills. After reading "Banana for Two" with E and C, I decided to incorporate a few grocery and counting related games into our play time. The stars aligned and I just so happened to receive an email from Melissa & Doug with a free healthy eating grocery list printable recently, and it is a great resource to save for both learning and play. You can print your own copy here . colored pencil for the first time. Since the Grocery List printable has different foods in nice, neat little squares I took this as the perfect opportunity to practice on some focused coloring with E. I pointed out to him that each food could be colored a different color, and helped him slow down and think about which color he wanted to make each food (as opposed to large scribbles across the entire sheet). It turned out to be a very good fine motor exercise for him, as well as a chance to slow down a little bit-which is a pretty big feat for an active almost three year old. Depending on your child's age and skills, you can also use this sheet for practice cutting, gluing, or even drawing. It would also be fun to make a grocery list using pictures cut from store flyers. Another fun way we played with the food list was as a matching game-I simply laid out a few different sets of food pictures and showed E how to match the items, and then count "one, two". I think after playing this way for a little while longer, we will be able to flip the food cards over and turn it into our own homemade memory game. After making our grocery list, we set up a small grocery store with our play foods, and made sure to set out foods we have multiples of so we could have some good counting opportunities. E had a great time choosing between his shopping cart or shopping basket, and picking out the different foods from his "store". Grocery store is definitely the new favorite pretend play activity in our house! E has a little bit of a "Supermarket Sweep" shopping mentality (who else thinks they should bring that show back?! ), but we also make sure to take the time and look at the foods he is "shopping" for. This is where I incorporated some of the Small Talk tips from "Banana for Two". As E shopped, I pointed out if he was choosing one or two of each item. E loves to count, and two is his absolute favorite number, so he really enjoyed counting the foods he chose, looking at the foods on his list and counting there, and checking off the items on his list as we shopped. Pretend veggies-a fun way to encourage real veggie love! It really is amazing to see how much enjoyment talking about these simple day to day tasks can bring to a toddler. It can be easy, in our busy and stressful adult worlds, to forget how new and exciting even the most dreaded chores like grocery shopping can be for a young child. This morning I let E know that we were going to be going to the grocery store. He's gone grocery shopping many times, and generally enjoys it-but today it turned into a whole new adventure. With all of his focus on our grocery games in the last few weeks, he really had a new level of enthusiasm for this simple trip we've made countless times before. E ran to find a grocery list, his shopping basket, and his puppy and waited by our front door to eagerly head to the store. He was so proud to walk the aisles of the grocery store and choose a treat to carry in his basket-and he brought smiles to lots of faces as he shopped! I love using objects from around the house to create new play opportunities for my toddlers. 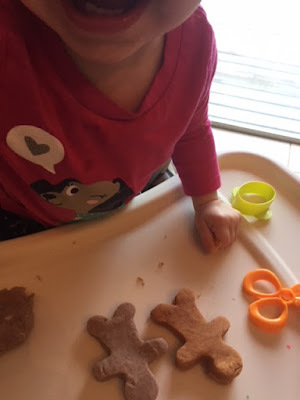 While I love Pinterest as much as the next mom, I usually don't have the energy or supplies to create some of the great activities that are out there. Instead I like finding things I can make in ten minutes, while my kids are happily eating lunch or (miracle) napping-and making things from stuff I already have hanging around the house. 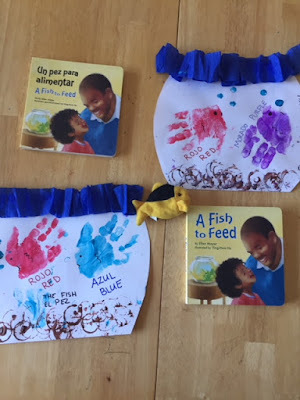 Here are two simple to make toddler activites that you can use for Valentine's Day, or any other time of the year. They are also easy to customize or switch up depending on what concepts you are working on with your little ones. Easy toddler games to keep you from going quackers! 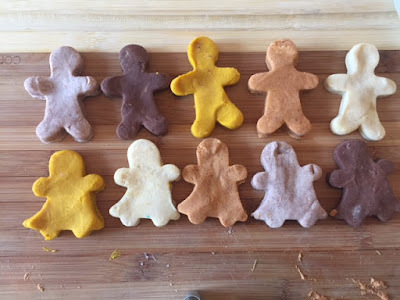 My first Busy Mom DIY is a chocolate treat match up. I used a $1 chocolate box and labeled spots “1, 2, 3”. Then I added some heart stickers on the bottom of our chocolate play food so we can practice counting and maybe start recognizing numbers a little! To play, we just empty the box and count as we add the chocolates back in, pointing out what the number looks like to get a little exposure in. You could just as easily use letters, shapes, or colors instead of numbers, depending on what you are working on at the moment. Don't have any pretend chocolates? 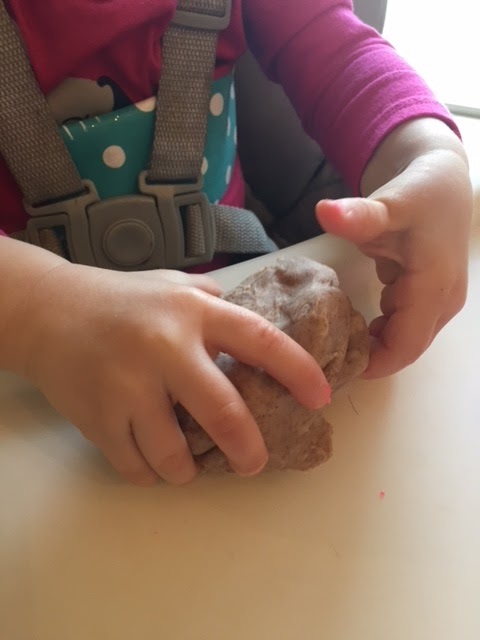 Use painted rocks, yogurt covers, sculpt treats from play dough-there are plenty of options hiding around the house, and your toddler won't mind if it doesn't look Pinterest perfect. (as if anyone would want to be on a no chocolate diet). We also have some sweet themed rubber ducks (my kids LOVE these ducks). I simply added a matching color sticker to the bottom of the duck and a corresponding sticker to the cupcake liner in the muffin tin (I used double stick tape to keep the liners in place). E knows his colors, so we are using this activity to work on the concept of matching-it’s easy enough for him to have success while he gets the hang of the idea of matching, and also easy to upgrade for matching shapes, letters, numbers, or even sight words later on. Plus E gets some extra practice naming the colors (still working on orange)! C loves simply placing the ducks in and out and carefully carrying the muffin tin from the table to the shelf. You can really use anything in place of the ducks to match a different holiday or theme, or just based off of what you have that is easily accessible. Visit my previous post to find out about or winter sensory table and matching Valentine's theme. Add about half a box of pasta to a gallon size plastic bag. We used different shapes and textures (shells, bow ties, ziti, spirals, wheels, smooth rigatoni (I need to study up on pasta names, I'm sure there is an actual name for that). Add about a teaspoon of food coloring. I used mostly gel, but also regular old fashioned food coloring, and I didn't notice a huge difference in the finished product. Finally add a small amount of vinegar (you can also use hand sanitizer) into a Ziploc baggie. Give it some good shaking until it is evenly coated, then let it sit for about ten minutes. Pour onto a paper towel or cookie sheet and allow a few hours to dry out. We used six different pasta types which filled the table nicely. We sorted by color this time, but shape or texture would be fun as well! We used the table as a light table briefly around Christmas. Basically E really loves having different things to drive his trucks through, so we played around with some old light strands and other odds and ends from the Christmas supplies (bows, small boxes, ribbons). It also added a nice little glow to the playroom in the weeks leading up to Christmas. Next we tried rainbow rice (made the same way as the rainbow pasta, above). This was definitely the messiest material we’ve had so far, so if you try it out just be comfortable with a little extra sweeping. E was pretty good about keeping the rice in the table, but quite a bit still ends up on the floor simply from moving toys. C, on the other hand, LOVED throwing big handfuls of rice into the floor, with a big smile on her face the whole time, fully embracing and enjoying her "defiant" side. Beyond that, both E and C enjoyed filling and dumping bottles, dropping the rice into the metal muffin tin (this makes a great sound and it was my favorite part of this table). Actually, when I wasn’t thinking about sweeping up the rice, it was pretty relaxing to play with. We also did lots of scooping, filling of trucks, burying objects (and hands), hiding little toys to search for in the rice, and we also tried out some of our bath strainers and funnels. We are still finding little rice grains here and there a couple weeks after cleaning this table up. You might try covering the floor with a large cloth or sheet in an attempt to confine the rice a little more, as I've seen some people do. Our newest table has a Valentine’s theme, and I even added a little shelf of related Valentine’s activities to go along with the table. I spent about $10 at the dollar store, along with some items we had at home. The table is filled with some silky rose petals, glittery hearts, foam conversation hearts, heart bead strands, fuzzy pipe cleaners, crinkly crepe paper, and a few scraps of tulle. C enjoys filling the Valentine’s mail boxes up, and we count the number of items we can fit into the boxes. She also enjoys when I hide the different objects in the mailbox and she can open it and see what’s inside. I added a Target cupcake puzzle that I’ve been saving, and we have been having fun hunting for the pieces and then completing the puzzle. Along with the usual scooping and filling items, we have some extra imaginative play items to fit a sweet shop theme. We have a few different pretend treats, and some oven mitts that E and C enjoy trying on. Check out my next post for our fun and easy Valentine's Day treat games! Today is the 5th annual Multicultural Children’s Book Day! This is my second year as a reviewer, and this year I had the opportunity to review multiple books! Read to the bottom and be rewarded with a coloring page version! 2018 Author SponsorsHonorary Author Sponsors: Author/Illustrator Aram Kim and Author/Illustrator Juana MedinaAuthor Janet Balletta, Author Susan Bernardo, Author Carmen Bernier-Grand, Author Tasheba Berry-McLaren and Space2Launch, Bollywood Groove Books, Author Anne Broyles, Author Kathleen Burkinshaw, Author Eugenia Chu, Author Lesa Cline-Ransome, Author Medeia Cohan and Shade 7 Publishing, Desi Babies, Author Dani Dixon and Tumble Creek Press, Author Judy Dodge Cummings, Author D.G. Driver, Author Nicole Fenner and Sister Girl Publishing, Debbi Michiko Florence, Author Josh Funk, Author Maria Gianferrari,Author Daphnie Glenn, Globe Smart Kids, Author Kimberly Gordon Biddle, Author Quentin Holmes, Author Esther Iverem, Jennifer Joseph: Alphabet Oddities, Author Kizzie Jones, Author Faith L Justice , Author P.J. LaRue and MysticPrincesses.com, Author Karen Leggett Abouraya, Author Sylvia Liu, Author Sherri Maret, Author Melissa Martin Ph.D., Author Lesli Mitchell, Pinky Mukhi and We Are One, Author Miranda Paul, Author Carlotta Penn, Real Dads Read, Greg Ransom, Author Sandra L. Richards, RealMVPKids Author Andrea Scott, Alva Sachs and Three Wishes Publishing, Shelly Bean the Sports Queen, Author Sarah Stevenson, Author Gayle H. Swift Author Elsa Takaoka, Author Christine Taylor-Butler,Nicholette Thomas and MFL Publishing Author Andrea Y. Wang, Author Jane Whittingham Author Natasha YimWe’d like to also give a shout-out to MCBD’s impressive CoHost Team who not only hosts the book review link-up on celebration day, but who also works tirelessly to spread the word of this event. View our CoHosts HERE.TWITTER PARTY Sponsored by Scholastic Book Clubs: MCBD’s super-popular (and crazy-fun) annual Twitter Party will be held 1/27/18 at 9:00pm.Join the conversation and win one of 12-5 book bundles and one Grand Prize Book Bundle (12 books) that will be given away at the party! 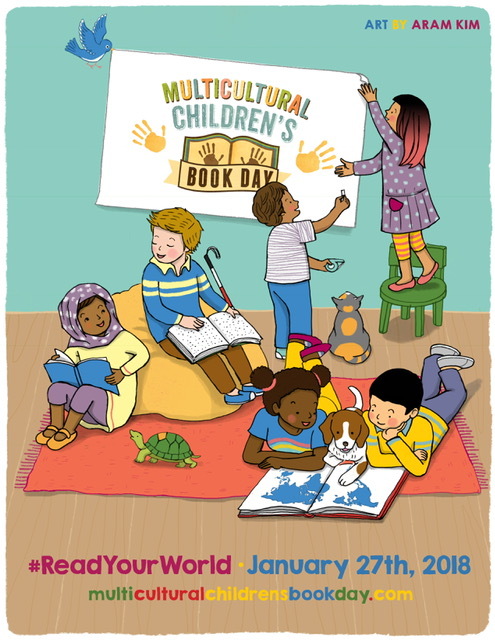 http://multiculturalchildrensbookday.com/twitter-party-great-conversations-fun-prizes-chance-readyourworld-1-27-18/Free Multicultural Books for Teachers: http://bit.ly/1kGZrtaFree Empathy Classroom Kit for Homeschoolers, Organizations, Librarians and Educators: http://multiculturalchildrensbookday.com/teacher-classroom-empathy-kit/Hashtag: Don’t forget to connect with us on social media and be sure and look for/use our official hashtag #ReadYourWorld. My first #partner book for this years MCBD was sent to me by Loving Lion Books. Written by Norah Barrett Cooper, this cheery, customizable book tells a simple and relatable story of a big family get together. A little girl eagerly awaits her family members’ arrivals, and the delicious meal they will create and share. She spends the day playing with her cousins, on what is clearly a happy occasion and joy filled day. Joelle Nelson’s bright illustrations add even more fun to the story. Many little readers are sure to connect to the story of a big family party and dinner, recalling their experiences with Thanksgiving meals, family reunions, special holidays, birthday celebrations, or even more regular family gatherings. The book emphasizes the importance of family togetherness in a general, almost subtle way. The simplicity of the message fits perfectly with the idea of a book with customization, because it allows for the more specific details to be filled in by the readers own experiences and memories. The types of foods eaten, games played, and stories told can easily mirror what any child has seen in their own life. I would love if even more customization options were added! Smiling faces, yummy food, hugs-what more could you want? This book would be appropriate in preschool and early elementary classrooms. 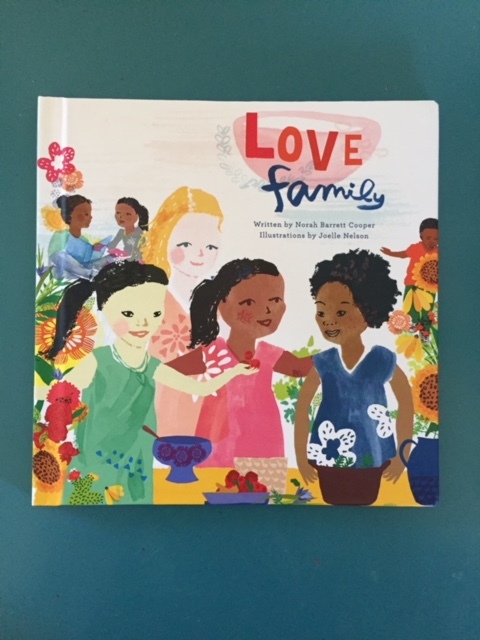 It would serve well as a jumping off point for discussing different celebrations and traditions in students’ families, maybe with a focus on compare and contrast-noticing our special differences, but also how some themes are universal within so many families. At home, as a book to play connection, we enjoyed making homemade play dough to create different skin colors and making families of all colors and sizes. 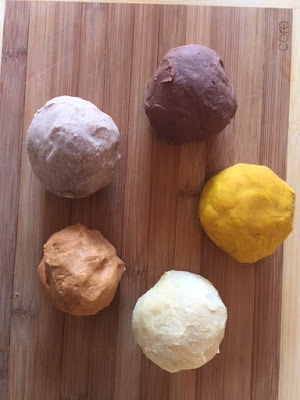 Our play dough recipe was inspired by craftulate.com and uses spices for coloring, so it is also a full sensory experience. 1 tbs of desired spice (cocoa powder for dark brown, cinnamon for lighter brown, paprika for copper red, turmeric for bright yellow, mustard powder for faint yellow). After mixing the ingredients thoroughly, heat the pan over medium heat and stir constantly. After about two minutes of stirring, your dough should begin to form a ball. Remove your dough ball from heat and place on wax paper. Allow a few minutes for cooling, and you can begin to kneed your dough-it’s ready to play! 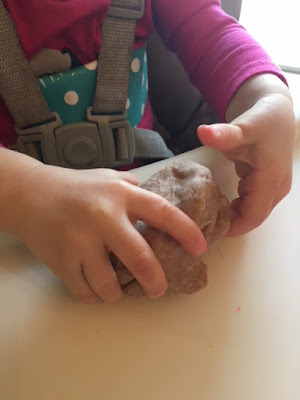 This dough is truly an awesome sensory tool. The different spices give off wonderfully different scents and have beautiful colors. Barring any allergies or sensitivities, they are taste safe (although they definitely don’t taste good)! You can feel the warm dough soon after it’s been prepared, or cold dough that has been in the refrigerator for a little while. 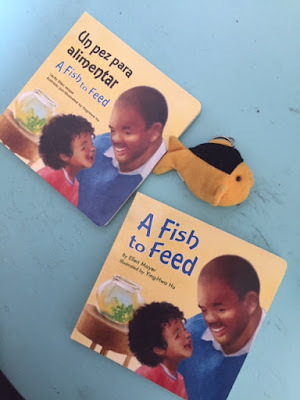 My second #partner book for MCBD 2018 is Star Bright Books “A Fish to Feed”. Star Bright Books features multilingual books in 23 languages, and is a fantastic resource for educators for English Language Learners, as well as parents and families. I was lucky enough to receive both the English only and the Spanish/English versions of this book. 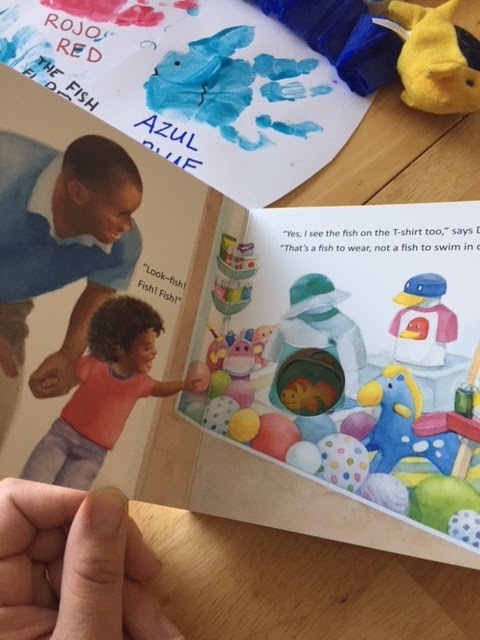 The story is fun for toddlers, and shows a father and son as they explore their neighborhood on the search for a new pet fish. The book features cutouts that allow you to peek through to the illustration on the next page. C (1.5) loved the little circle cutouts and being able to touch the next page through them, or look through the little circle onto the next page. I loved how this feature added a little something extra to the story, and thought it was a pretty creative illustration feature. 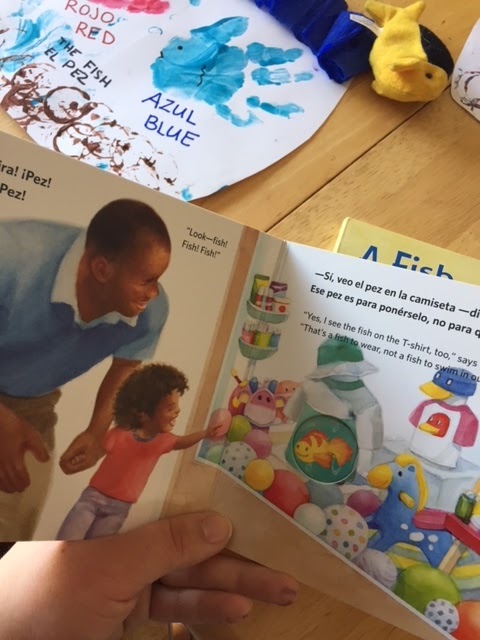 The story models conversation between the father and son, and includes a message to parents about their child’s language development and how to enhance that through conversation. The text of the story furthers the message to parents, showing how father elaborates on the conversation with the child to further their ideas and introduce new vocabulary. These elements make the book as much a tool to teach parents as it is an enjoyable story for little ones. As a parent of a child with a speech delay, I greatly appreciate the professional information presented at the beginning of the book regarding language development and how to help your child grow in that area. Star Bright offers books in Amharic, Arabic, Bengali, Burmese Karen, Burmese, Chinese, English, Farsi, French, Haitian Creole, Hebrew, Hmong, Japanese, Korean, Navajo, Ojibwe, Portuguese, Russian, Somali, Spanish, Tagalog, Urdu, and Vietnamese. Some languages are available on their own and all are available in multi language books paired with English. As our book to play project connection with “A Fish to Feed”, we created our own hand print fish pets. A paper plate would work great for this activity, but we just used a regular piece of paper (someone forgot to get paper plates at the grocery store). E (2.5) picked out his favorite colors to make his hand prints pets, and we added some eyes and features together. Crepe paper made our “water”, and we experimented with a few different tools to stamp on bubbles and rocks. Finally I labeled our fish colors with the English and Spanish words. E loves naming the colors, so he had a great time with this project! 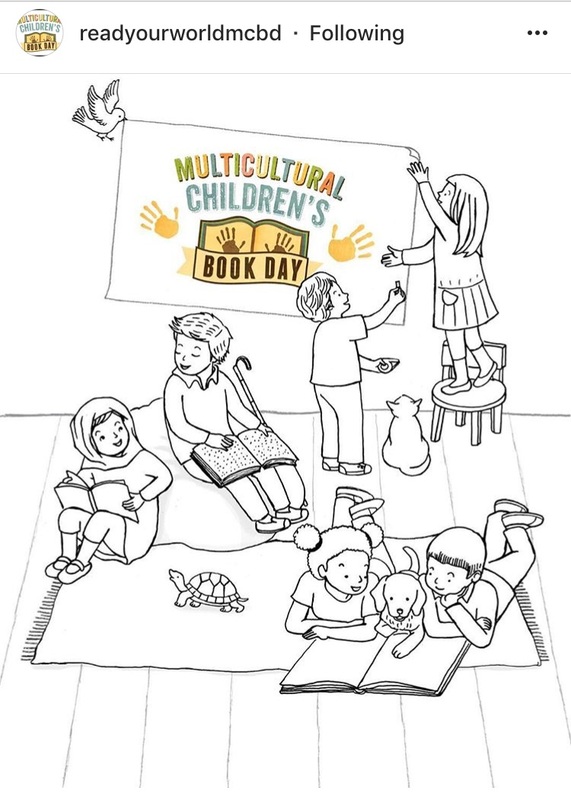 I hope you've enjoyed learning about a few new books and publishers in the world of Multicultural Children's Books. Check out the hashtag #ReadYourWorld on social media for even more reviews and recommendations. Follow the link in the caption below to print out your free coloring page, designed by Aram Kim!